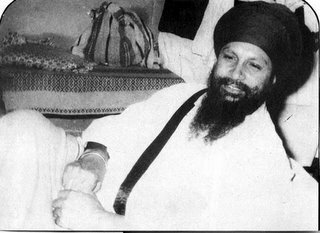 Sant Kartar Singh Bhindranwale went on parchar missions not just inside Punjab but all across India including Calcutta and Bombay. Sant Kartar Singh would not eat food from the home of a manmukh. Only an amritdhari family could prepare the food for him. But it must be noted that if any family, be they Sikh or Punjabi, even if they were not amritdhari, wished to meet Sant jee, he would certainly go and encourage them to chhak amrit. During Sant jee’s program in Bombay, a Punjabi Sikh (who was a truck driver) asked Sant jee to visit his home. Sant jee gave him a time he would arrive. The next day at the set time, Sant jee along with the other Singhs arrived at the home. Seeing them, the driver left his home and hid at the neighbours. He was afraid that if Sant jee saw he was an alcoholic he may receive a curse. Both husband and wife promised to chhak amrit soon and Sant jee himself stood and did the ardaas. Jaikaras were shouted at the end. Today, in short, Piara Singh does seva in the Punj Pyaray when amrit sinchaars take place in Bombay. Along with Sikh, great success came to his home and his business increased many fold. Young Harbhajan Singh [Bhai Amrik Singh was called Harbhajan Singh in the Jatha], please accept my Gur Fateh. The Jatha is happy and I hope you are also doing well. I sent a letter to our village but have not received a reply. The Jatha will leave Calcutta on 27 Fuggan to go to Sri Hazoor Sahib to celebrate Holla Mohalla and then there will be programs in Bombay. I have heard that you are eating whatever from just any store. This is not right. Look at the honour of the Jatha, look at your own jeevan. I want you to make you a beautiful and strong preacher of Gurmat but you too must make your lifestyle high. I will be ashamed if someone says that Harbhajan Singh doesn’t keep rehit, doesn’t read bani and eats just anywhere. Don’t make any mistakes. Study with attention and get good marks. Be sure to read bani, keep rehit and then your studying will be fruitful, otherwise not. What more should I write? You are smart and you will understand this to be enough. May Maharaj do kirpa on you and keep you in Chardi Kala. Fateh from the entire Jatha. Send me a letter in your own hand and tell me about how things are going in the village. This letter was sent by hand through Baba Thara Singh who was to also personally tell Bhai Sahib not to eat anything from outside. Later on, Bhai Sahib stopped eating from the cafeteria and began eating at the home of a local Gursikh, Bhai Avtar Singh. Edited 2 time(s). Last edit at 12/11/2009 02:09PM by admin. thanks for this post. You are doing a great seva for the youth. "But it must be noted that if any family, be they Sikh or Punjabi, even if they were not amritdhari, wished to meet Sant jee, he would certainly go and encourage them to chhak amrit." 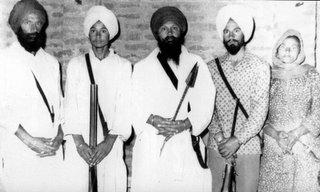 Did Singh Bhindranwale encourage even Non-Sikhs to take amrit?